Low-wing cantilever monoplane. Wing in three sections, comprising centre-section and two tapering outer sections set at six degrees dihedral. All metal twin-spar structure. Hydraulically-operated flaps inboard of ailerons, the latter being interconnected with the flaps and arranged to drop to augment flap area for landing. Fuselage is an all-metal semi-monocoque structure. Cantilever monoplane type tail unit. All-metal tailplane and fin, metal framed fabric-covered rudder and elevators. Fixed tail-wheel type undercarriage. Hydraulic operation with main wheels retracting into the engine nacelles. Oleo shock absorbers and hydraulic brakes. Two Racovica-built 600 hp Pratt and Whitney R-1340-AN1 radial air cooled engines. Three-bladed constant speed hydromatic airscrews. Fuel tanks have a maximum capacity of 1,650 litres. Maximum oil capacity 120 litres. Accommodation for a crew of two and up to ten passengers. 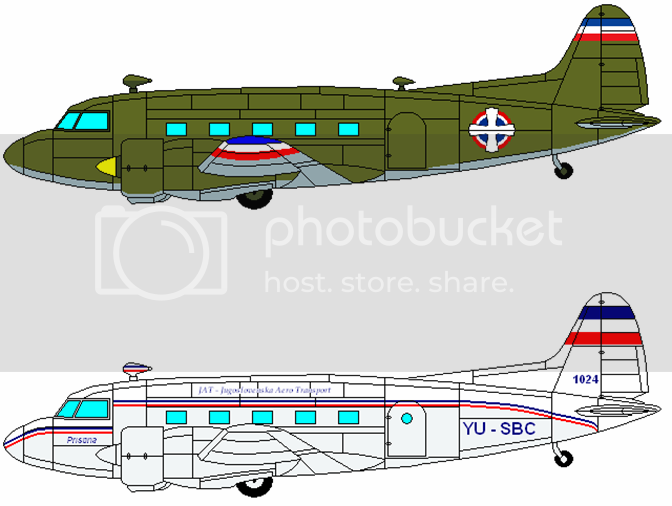 The basic aircraft can be configured as a light transport seating ten, as a navigation, wireless, multi-engine and blind-flying training aircraft, or as a bombing and photographic training aircraft. Equipment for military roles includes an oxygen system, wireless, interphone system, etc. Span 18.40 metres; length 13.80 metres; height 3.95 metres. Wing area 41.80 metres. Empty weight 3,600 kg. Weight loaded 5,500 kg. Wing loading 131 kg per square metre. Power loading 5.5 kg per horsepower. Maximum speed 340 kph. Landing speed 120 kph. Service ceiling 5,900 metres. Range 1,000 kilometres. Duration – four hours. It is expected that a prototype may fly in the spring of 1941, and if tests are successful, construction of an initial series of twenty-five aircraft may begin as early as November 1941. Too bad this wasn't out in 1940; would have made a good alternative to the Bulgarian KB-9 Bekas. Unfortunately the needs of the Royal Yugoslav Air Force to develop its combat aircraft delayed development. Such are the vagaries of engineering. Yes. Just one of those misfortunes. Will any perhaps show up in Afghanistan at some point? Might make a good hands-on testing ground for them. That depends on how long the LONAFF commitment to Afghanistan continues. With even pre-production aircraft unlikely to be available until the summer of 1941, the earliest I could see an aircraft showing up in Afghanistan is September. No doubt they would be useful, and the Yugoslavs would like to get them there; their Dakotas are working overtime. But the home industry can only do so much at a time. Looks nifty, I can see some use for this plane. Should do well export wise to smaller nations for civil use and Warsaw Pact nations. Is a bit small perhaps to compete with the newer medium airliners. Can't see the YAF buying many crew trainers but as a light transport they should do well. Well, the RYAF has its Lockheed Electras to replace as well as making do with attrition; I suspect that it might take somewhere between 25 and 50 in the trainer role over the years. I'd hope to be able to supply the type to the Warsaw Pact, but the design was out of cycle for the Bulgarians and the other WP nations haven't made their trainer needs clear at this point. I am actually hoping that it can fill the niche of an inexpensive civil feederliner.